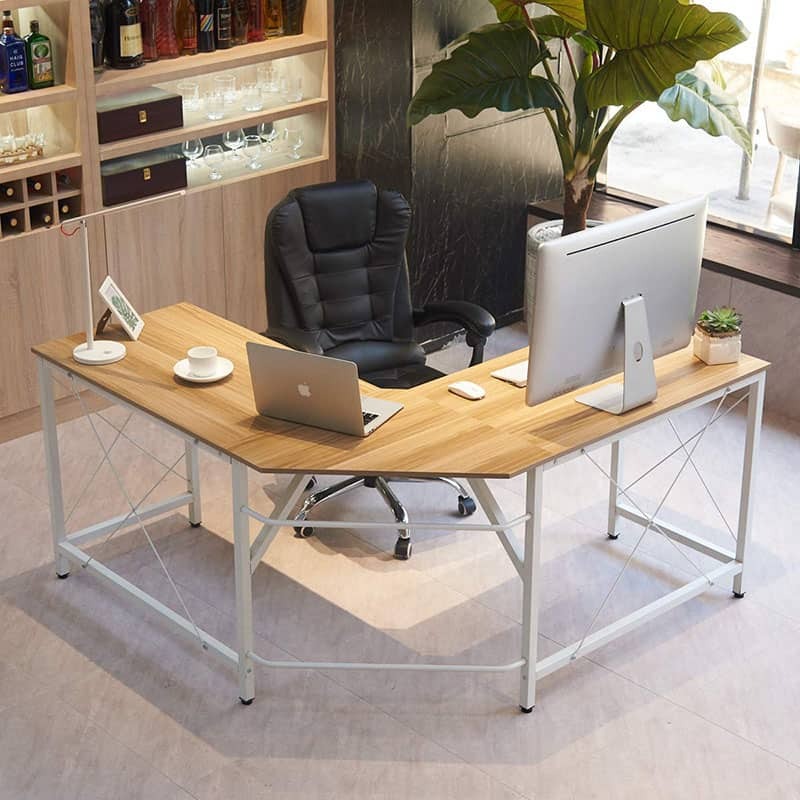 This L-Shape Computer Desk is a practical design, allows you to use the 2 sides of the desk, which is convenient for your work, and it can provide you with an incomparable convenience. Here is our selection of 9 Corner Computer Desk Designs to Buy Right Now from Amazon. Don’t forget to visit our article about 30 Creative Computer Workstation Ideas to Inspire You! Enjoy! The wide desktop provides ample space for a computer, monitor, printer and other home office accessories. With an open and concealed storage space, this filing cabinet is suitable for different storage needs like A4, letter and legal size file folders to suit many office cache needs. Now make most of your living/office area with our flexi rotating corner Desk. Redefine your corners at your workspace or even at your study area with the white desk with drawers with bookshelves. 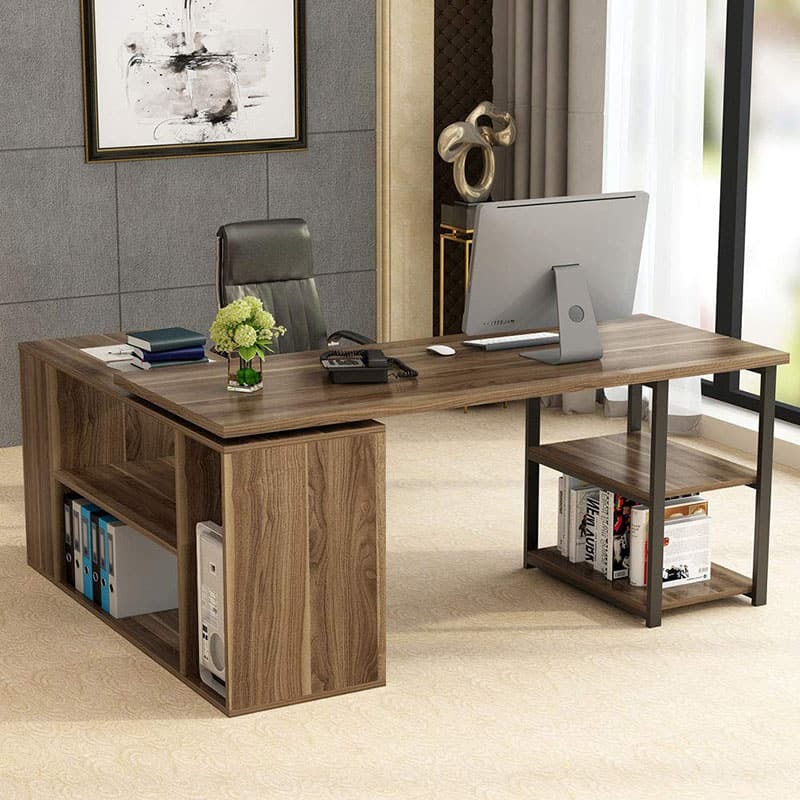 This L shaped desk can be used as a left or right hand corner computer table or a nice long simple straight desk.Classic modern look at your office or home.The multi-functional design allows it to fold and store away easily when not in use.Create a stylish working station and bookshelf in one with this unique desk. L-Shaped Corner desk, great for a small space, have large leg room. Love the way that swivels to make an L or straight. Swivel desktop allows for different configurations, easily extend to as a L-shaped corner desk or rectangular large size desk for two person, or you can overlap the two desktop together. If You Are Looking for A Computer Desk with Various Using Ways, Tribesigns 360° Rotating L-shape Computer Desk is Just The One You Want ! You can easily swing the large desk part to left or right side per your needs, the rotating feature is more useful than you think! 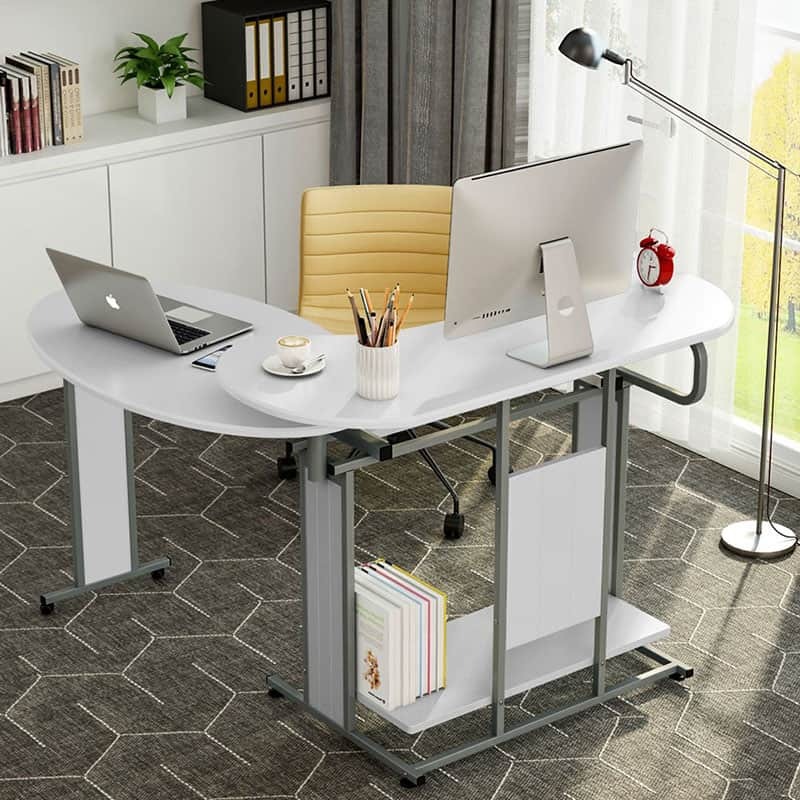 The L-shaped corner design of the Mecor computer desk has wide desktop,you will have plenty of surface space for writing,computer work and other home office activities. Made of high quality clear tempered glass for safety and beautiful appearance.This computer table can also be used as a console table in your office,living room or somewhere else. Build a beautiful and sturdy home office space with the Bush Furniture Yorktown Collection in Antique Cherry. Computer Desk surface has plenty of room for a laptop, printer, papers and more with space to spread out. An open storage compartment below holds a laptop or tablet when not in use to clear the work surface. A box drawer stores supplies, and a file drawer extends fully on ball-bearing slides for easy access to letter-sized papers. Hutch features two closed storage compartments to conceal papers and binders with self-closing Euro-style hinges. Open storage cubbies in the middle have two adjustable shelves so you can put memorabilia and binders where you want them. With a weathered Antique Cherry finish accented by oil-rubbed Bronze hardware and beveled edges, this collection makes an attractive addition to your home. Double desktop can improve space utilization. Perfect for you with multiple screens and many supplies. Abundant surface space and compactly placement without concern of collapsing. Love it! Beautiful color great use of space. Just glad I didn’t have to put it together! Thanks Honey! It did come with one small broken piece which was still useable but was replaced with no hassle! 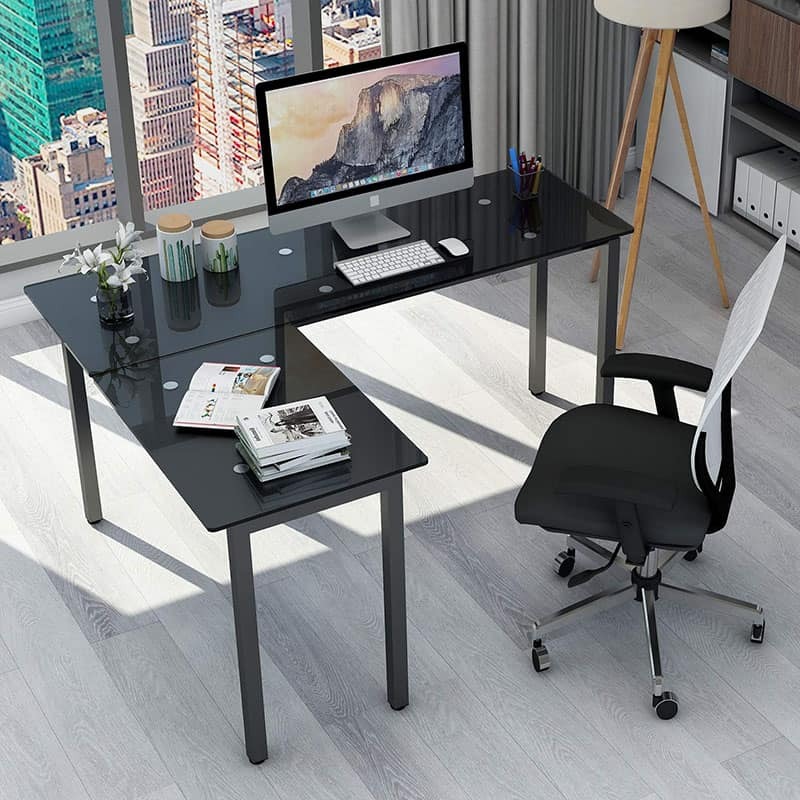 This L shaped desk offers a sleek modern design crafted with durable steel .Made of large desktop in 3 pieces, the desk can be separated into two tables, which help expand the space effectively and compliment any room even for a small room. Safety round corner design with adjustable leg pads, which make the table keep stable even on uneven floor. It is also a great addition to any home office. Desk is reversible. Flexible configuration options allow you to assemble L shape on both right and left side. Slide the side table to the level of the main table, the length of the desktop can be extended from 1.2m to 2m. 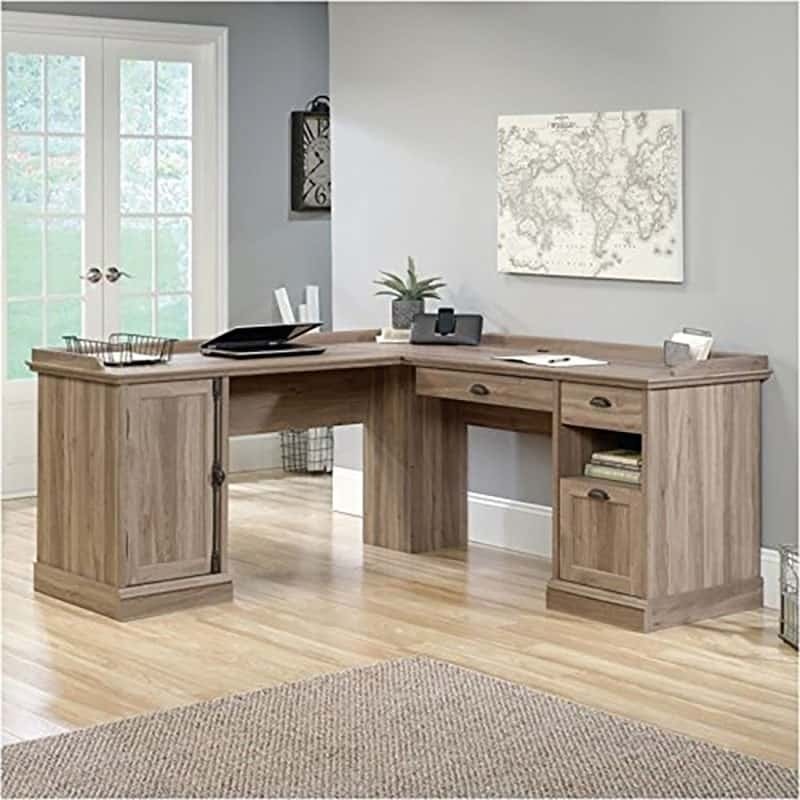 Create a rustic feel to your home office with the Ameriwood Home Wildwood L-shaped lift top desk. The desk is made from MDF and wood veneer with sturdy metal accents that are sure to be a stunning addition to your work space. The weathered white finish gives you an at home feeling while you work. The L-shape of the desk keeps your computer and all of your paperwork within arm’s reach while giving you multiple options for arranging your space. You can place the desk in the Middle of the room, or if you’re tight on space, simply put the desk in the corner to open up the area. The drawer is a great way to store all of your office supplies such as pencils, tape and paper. The desk also features a lift-top so you can easily go from sitting to standing while you work. 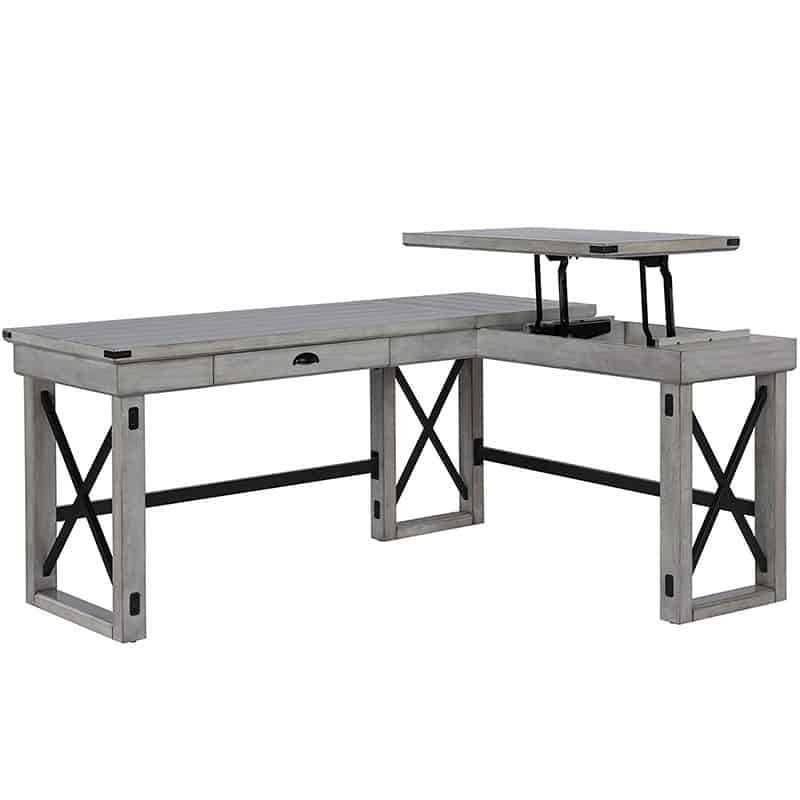 The Ameriwood Home Wildwood L-shaped desk is shipped in 2 boxes, ships flat to your door, and requires assembly upon opening. The desk top can hold up to 60 lbs.